The Greek mathematician and philosopher, Archimedes, is believed to have said, “give me a place to stand on and I will move the Earth.” These were powerful words spoken then and equally powerful words if we dare to speak them today. Archimedes was literally talking about moving the earth. He believed that if his feet were planted in some particular spot and if a big enough lever were placed under the earth, he would, in fact, be able to move it. One person coming up against a massive obstacle and moving it is a story that, when told, never gets old. Poems have been written, songs sung and movies made depicting the dismantling of a long held belief, practice or sin and the relief and triumph that comes with change. Public Servants have long witnessed the dismantling of one policy or another. At times, the policy has energized allies — natural or otherwise. During those times, dismantling often included organized and spontaneous protests and protesting. It still does. Protests or not, public servants were and are obliged, commanded or compelled to keep the doors of government open and its systems operating. In a previous column, I remarked there was a lot of yelling going on about government and administrations around the world. It may be a bit simplistic to think the world had stopped to watch U.S. events, but I can’t imagine our actions in the past few weeks went unnoticed. One day the world tuned in to testimonies and votes in Washington, D.C. and the next day they turned their attention to Chicago, Illinois. Both events played out within the structure of its own bureaucracy, but both with very different outcomes. Both events said something about the power of one, but again with very different outcomes. While protest in the U.S. is seen as an embedded form of civil disobedience, the protest climate we are now experiencing exposes the deep fissures that still cripple and misshapen the body politic. The protests serve as a resistance to unfair and irregular application of law and punishment, thus rejecting what has been for many the natural environment of inequality. To be sure, there is nothing natural about inequality. Inequality is imposed and often codified until courageous and well-meaning individuals apply a lever of pressure big enough to move it. What should the nature of these protests mean in relation to the work we perform as public servants? Answering that question requires much more than carefully worded notions and theories. It requires a vision that states that even during daily protests from our citizens, we know that there is still something we can study and that there are questions we can still try to answer. If there is one major lesson we have derived from past and present public management and public leadership examples it is that one size does not fit all. Public Servants must continue to engage the people we serve in conversations that produce actionable outcomes that enhance lives. Protests are not always merely systemic, more often they are movements against operations that reinforce social environments which legal systems and policies have created. Public Service does not isolate us from these unnatural creations of forced reality. Instead, our duty is to correct ourselves and in doing so we dismantle the practices which ignore the humanity in those we serve. As with most disciplines, Public Administration has a Code of Ethics which outlines the behaviors and the beliefs of public servants. One only needs to visit the website of the American Society for Public Administrators (ASPA) to read the Code and the ASPA Code of Ethics Review Process. In the current protest climate, we are privy to a host of beliefs often scribbled on posters, t-shirts, hands or foreheads. The beliefs read like a live novel of micro-narratives. A protest may be organized around a single issue, but everyone brings his or her own story to the collective chant. The protest then becomes the opportunity for a string of one or two-line statements that tally up the infractions to date. Although these statements are often lively and passionately delivered, distinguishable is the pain in the faces of the protestors. Sadly, these statements are the new verses of inequality which public servants must begin to earnestly hear and sincerely address. 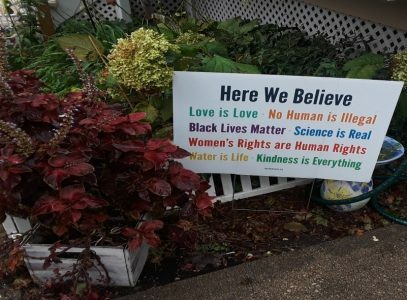 During one of my walks in Chicago, I came across a Here We Believe yard sign. The sign contains seven different beliefs written in seven different colors and symbolizing the array of support for various causes. Each belief is its own conversation and each belief is its own theme. But, taken together it represents a mandate for life, for work and for equality. And that is a mandate that we should all believe. 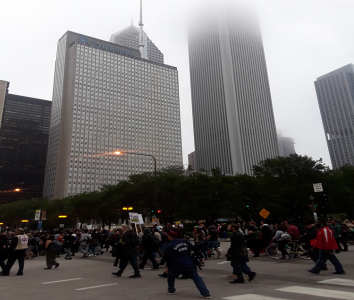 Images: All images were taken by Lisa Saye in Chicago, Illinois. Your articles are always inspiring and allows students in Public Policy and Administration the ability to see the many directions public servants have to serve. Serving, while living by a Code of Ethics often requires sacrifice. We often see the sacrifice exhibited by the Power of One. I agree public servants must serve citizens, and not perform in vanity, just exercising their authority to prove who they are. We all have the power to make a change, even when it demands civil disobedience. Excellent article Dr. Saye, we all have to see ourselves in a mirror as public servants. Hassan, thanks for your comment. Public Servants are indeed duty-bound to find and fill ‘gaps in government performance.’ Thanks for all of your additional insight. Mike, thanks for the Lew comment. True indeed. My takeaway is that the best and brightest are needed for public service. Jack Lew underscored this assertion by stressing that “no higher calling in terms of a career than public service which is a chance to make a difference in peoples lives and improve the world. In attempt to answer your question “What should the nature of these protests mean in relation to the work we perform as public servants?” I think that the protests are a thermometer that the state can use it to measure the public satisfaction. The official may believe that popular protests are merely a technique of opposition parties, resisting them through repression and oppression, and may be seen by the official as a good tool for assessing overall performance in society, trying to study protesters’ demands and work to fill gaps in government performance. So I find it necessary to listen to dissenting or argumentative opinions and try to evaluate their demands with an objective view. I believe that the public servant should do the duty of the citizens and not satisfy his desires to exercise authority and vanity. Therefore, I find it necessary to listen to dissenting or provocative opinions and to try to assess their demands with an objective view. I believe that the public servant must commit himself to performing the duty for the citizen’s interest, and not to satisfy his desires to exercise authority and vanity.